Address: Board of Intermediate and Secondary Education DG Khan. 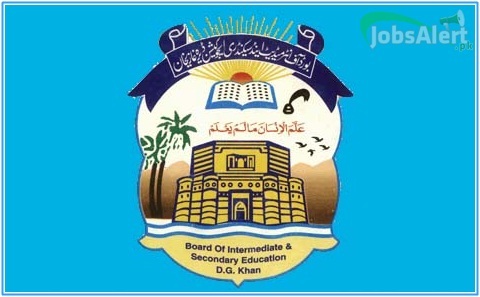 Get 11th Class Result 2018 DG Khan Board Inter Part 1 Check Online from www.bisedgkhan.edu.pk 11th Class Result on October 10, 2018. As form the above heading it's quite clear that the Board of Intermediate and Secondary Education DG Khan is going to remove the curtain for the most awaiting news of Inter Part 1 Result 2018 of final examination which was held in the month of May and now the result is about to come. As it is the height of excitement and nervousness because the result is going to be declared on above-mentioned date. So guys, hold your hearts tight because very few days are remaining to make the preparation for getting admission in the next class. We all wish you best of luck and we pray that you may secure good grades and go ahead with flying colors. Now, I will let you know about the detailed information about this Educational Board. Board of Intermediate & Secondary Education Dera Ghazi Khan is the Govt body which is preceded by the Ministry of Education and is usually responsible for maintaining the educational and examination system of respective district and under those districts which are on this board. Most of the senior members deiced all the matters and amendments and further developmental processes in the educational system. Now, have its further details in the below headings. This board is also from one of Punjab’s Board which came into existence on 4th January 1989. The Board is located in the Chowk Sarwar Wali. The official website is www.bisedgkhan.edu.pk. Conduction of SSC & HSSC Part-01 & 02 Examination every year. Deciding the examination date and its allocation to the respective schools and colleges. Preparation of examination and printing of paper on time. The announcement of result and preparation of result with awarding scholarships and shields. So, these all the functions which are performed ever by each and every provincial board with great honesty and hard work. As, nowadays each and everything getting and buying has become so fast through online facilities so similarly now students can avail their result online of Inter Part 1 for DG Khan Board on 10th October 2018 and all Punjab Boards from well known, top class and fastest service providing page named “JobsAlert.pk” along with a proper name and roll number. So, prevail this news to your cousins, friends, and mates that they can avail it instantly without wasting any single minute and find their result without having any hurdle while sitting anywhere from this page.